We all know a healthy diet is essential for all aspects of health, but what if we can further hack our lifespans by controlling our feeding windows? You can...it's called intermittent fasting! If the direction current science is heading is any indication, taking charge of when to eat means taking charge of many levers in your biology that can lead to a long, healthy life. 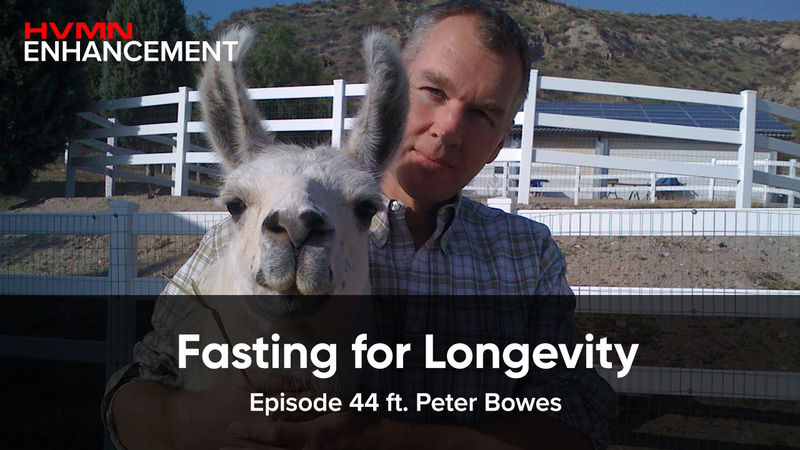 Episode 44 features Peter Bowes, a BBC reporter and host of the LLAMA Podcast. One of the earliest supporters of HVMN's foray into intermittent fasting, Peter shares our core value of creating an open forum for the community to support and become educated. Peter has always had a foundational interest in longevity, spurring him to experiment with various practices and connect with thought-leaders around the world. The experimentation will never end, but it's safe to say that Peter, like many biohackers, found intermittent fasting to be a biohack he will implement for the rest of his life. Geoff:	Hey, everyone. Welcome to the HVMN Enhancement podcast, the new name from the Thinking Podcast. I'm your host, Geoffrey Woo. And I'm really excited to have Peter Bowes with me today. Peter is a longtime experienced reporter for the VBC, and also the host of the LLAMA Podcast. And we've gotten to know each other over the last couple years, when Peter had an assignment to cover fasting in Silicon Valley, and we became friends, connecting over all sorts of weird ... Now it doesn't seem that weird, but I guess for the general population, weird sort of eating routines, or weird regiments to potentially increase our longevity. So, I'm really excited to turn the tides here, turn the tables here, where I'm the host, and Peter's the subject. Welcome to the show. Peter:	Thank you, Geoff. Good to talk to you again. Geoff:	Yeah. So, we've obviously, I think even in the last year ago, seen bit of a tidal shift, going from fasting, more and more going into the mainstream. I'm curious how you first started getting into the notion of fasting. I know you've been covering this space for a few years now. Peter:	Yeah. It's quite a long journey. And it's a journey, I think, that still has a long way to go, for a lot of the reasons that you've just been spelling out, in terms of the sciences progressing. But then, I think the acceptability factor is still kind of hanging in the air, in terms of the fasting, and peoples' understanding of what fasting is. So, my journey, it started with a series of BBC documentaries and features that I was doing covering different aspects of health and fitness, and that included diet. And eventually, it lead me to fasting, and to groups like yours. So, I made, for example, a documentary about one of the so-called Blues Owns, just outside of Los Angeles. And for all, they're not a particularly fasting community oriented group of people. I think their longevity ... They live eight to 10 years longer than most Americans. Diet is a key component of, I think, one of their secrets to longevity; the others being the amount of exercise they do. And I think there's a certain element of a spirituality. It's a seventh day Adventist community, and they respect the Sabbath being a Saturday. I don't think you necessarily need to be religious for this to work for you. But, it's a kind of, "Let's move away from technology, let's spend time with our families, let's just decompress for a little while." And I think those three components of exercise, and diet, and spirituality all help them achieve a great age. So, that's kind of history, covering stories like that, and it led me to you, and to your group, and we had a great breakfast in San Francisco. And that was a beginning, really, I think ... I've done some stuff with Valter Longo at USC, of course, and taken part in a clinical trial, periodic fasting, as opposed to the more intermittent fasting that you do. But, all in all, it sparked my interest, and I think there's still a long way to go in it. Geoff:	So, when that initial seventh day Adventist story came, was that something that you were motivated to cover yourself, or it was an editor assigning that on your desk? How did you even come across those initial inklings of a story? Peter:	Yeah. It's always a little bit of both. But, sometimes an editor will have a vague idea as to an idea, or a title for a documentary series, and it's left to you, the reporter, to fill in the gaps, and really to find the story. So, I was asked to do a series ... Actually, the very vague title of "what if". "What if" was all I was given. And so, I added to that, "Well, what if we could stay young forever? And "what if we could stay young forever" became the title of a series of features that I did, looking at different aspects of longevity, from diet, and exercise, et cetera. And that's what led me to ... And I did some reading, obviously, and discovered Loma Linda. Their longevity is quite well documented, and there's been a very longterm study with the university; they're looking at these people and really what goes into their longevity. So, it was a story there that had been told before, but I wanted to dig a little bit deeper, go there, meet some people, I met some fantastic, incredible people, centenarians included, who have lived amazing lives, and many cases, very simple lives. And for all you and I are interested in the science and the technology that goes into living for a long time, sometime, it's the simplicity of a basic lifestyle that'll actually help you achieve that. Geoff:	Yeah, no; I think that's an interesting point, where perhaps one of the negative sides of being overly thoughtful or overly rigorous is that you stress yourself about keeping your biometrics straight, or keeping your stress up to do all these routines. Where, perhaps just being really, really relaxed, and having a lot of downtime ... It seems like there are communities, like Sicilians, or the Okinawans, who have a much simpler, comparatively simpler lifestyles, where they're not as rigorous around the diet, but it seems like they have two, three hour lunches with their families. Perhaps that ends up driving lower cortisol levels, lowered stress levels. I think these things are all interrelated; the human system is a very complex network. How do tweak not just one small aspect of a diet, but everything else is worth looking at. Peter:	Yeah. I agree totally. And one of the simplest things you can do for yourself is get up in the morning and go for a 30 minute walk. You don't need any technology. You don't need anything more than your shoes, and a pair of shorts, and T-shirt, and off you go, and have a great, relaxing walk. You don't need tech to do that. But, the exciting thing, and looking to the future, is how technology is helping us understand what that 30 minuted walk is doing to us. And you don't have to embrace it, but if you do, I think you can be invigorated by looking at your watch, whichever kind of watch it is, they show your heart rates, or whatever biometric you want to measures, and understand how that is benefiting you, and then perhaps look later in the day when you are in a more stressful situation, you're behind your desk at work, or whatever you're doing, and you see your heart rate changing. A greater understanding of how different lifestyles are affected by simple inputs, those inputs that you talk about a lot, that we can change; I think that is the exciting thing. That's what I enjoy doing. So, I like embracing the simplicity of some of the very old fashioned things that we can do with the tech that we have today. Geoff:	So, I'm curious how that journey started from that initial "what if" documentary series; how did that connect you ... From my understanding, that connected you to perhaps USC, Valter Longo's research, and then from there, it sort of evolved from there. Was there anything missing in those dots? Or, was it sort of like, once you saw these centenarians, you're like, "Hey, I want to live to 100, now I want to copy some of their behaviors." How did it involve into ... The story to a little bit of a personal hobby? Geoff:	What's your marathon time? Peter:	My best marathon time was 3:42, which is pretty respectable. I did five altogether, so 3:42 was the best I got. Have you done a marathon? Geoff:	No. But, a couple of my colleagues here are doing half marathons. Michael, my co-founder, did a 125 half, and Brianna did a 135 half. So, they're pretty speedy. They were like top 50 ... Well, Brianna's like a top 50 woman finisher in the half marathon in San Francisco. And then, Michael was a top 100 overall, out of like 5,000 people. Peter:	Yeah. Great. That's good. So, yeah; cool. I was doing that in my 30s, and as you get older your exercise regime changes. But, my interest in the science, and especially the tech side of things, really increased in the last 10 years or so, when I started to meet people like Walter at USC, and others. So, my journey stems from a basic interest in my own longevity. And I think we all, on a scale from one to 10, we vary considerably, don't we, as to how much we think about our longevity, and why we want to live to be a great age. A lot of people ... And this is one of the things I explore in my podcast, and nearly always asks the same penultimate question; "What do you think about your own longevity? Why do you want to live a great age if indeed you do?" And everyone seems to have a slightly different answer to that. Geoff:	What's your answer? What is your answer, and what's the best answer you've heard? Peter:	A lot of the answers are quite similar, but the best answers are actually parallel with how I feel about my life and the longevity, in that life is good, basically life is potentially very good, lived the correct way, lived the way that I want to live it, and you might as well enjoy it, because the alternative isn't particularly exciting. This is a wonderful world, and tech is exciting, you don't necessarily need tech to live that exciting life, but it's a much smaller world thanks to tech, in many respects, that we can travel we can do things. And that's why I want to live, because I want to see ... I'm a journalist. I often say it's because I want to see what happens next. We're just dipping our fingers and toes into all of these things at the moment, but what's going to happen next? What will Apple be announcing in 10 years time? What infomercial from Apple, or whichever tech giant is dominating the scene in 10 years time; what will they be telling us about. I can't wait to see. So, that is a big part of why I want to keep on living. Geoff:	No, that definitely resonates with myself. We have an infinite time of not having any consciousness, essentially an infinite amount of time before we weren't alive, it's going to be a close to infinite amount of time that we're dead; so, having a little bit more time of having some consciousness, some perception of reality, yeah, why not? It's fun. I think if you're basically healthy, and have your needs covered, you can always revert into a very fun, childlike state of exploring the world, where I think ... Yeah, you could get into why people would want to die earlier, but I think people stress themselves out, essentially, to the point where it's like, "It's not worth living anymore." Peter:	Yeah. Yeah, exactly. And the other element of this isn't ... And I talk a lot about health span, versus life span. And you hear, anecdotally, a lot of people say, "Oh, we're all living longer." And it's true, we are living longer, but what state of health are we in in the final decade, or so? And that's that crucial health span stage. We don't want to live long and be in a chair with a walker. There are legions of people in that position in nursing homes, whatever. And clearly, there's no alternative for some people, and that is sad. But, there is a lot that we can do to extend those years, those healthy health span years, to optimize our health. And that is another key goal of my motivation; just to try to stave off those killer diseases of old age. And the scientific evidence, especially as it relates to cancer, is so exciting. In terms of the quite simple things we can do, especially as they apply to diet, to prevent, perhaps, some cancers, or at least delay the time that they hit us, and then hopefully it's for quite a short period of time. Geoff:	Yeah. What are some of the interesting studies? I definitely have some in mind around interesting data around regenerating your immune system after around three days of fasting, really interesting data around the cancer effects, around IGF-1, a growth factor that ... And I think it's a trade off; you want a growth factor to grow muscle, but if you overstimulate your growth factor, that fuels cancer cells. But also things like ketone bodies, which are interesting, because a lot of cancers only can use sugar, glycolysis to produce energy, but if you can feed ketones instead, perhaps you can starve the cancer cells, and fuel the healthy cells. I'm curious what are the most interesting mechanisms, perhaps, that you've uncovered in your discovery here? Geoff:	Without having to be too disciplined; you have some satiation from the calories. Geoff:	Yeah. It ends up being starvation, right? Our species have faced starvation for the longest time. Yeah. Famine is probably one of the biggest killers in the history of humanity, in a lot of ways. So, when we talk about fasting, let's ... And I think that's the right caveat; consult your medical doctor, and stay sensible. If you don't feel good, just don't do it. Peter:	Even before it gets to the starvation phase, there are other potential dangers, like combining fasting with certain medications is not necessarily good, especially as it applies to blood pressure, because generally in the fasted state, your blood pressure will come down, but if you're on blood pressure medications to start with, that may not be a good thing. So, there's a big red flag there. Obviously, nursing mothers, pregnant women, people with diabetes, heart disease, there's all sorts of conditions; you just need to be super careful. As you say, that's kind of the obvious health warning; talk to your doctor first. But, once you get in that fasted state, and you do the five days, purely talking from my perspective, the results was, yes, weight loss of probably six to eight pounds over five days; which, sounds quite a lot. And my blood pressure came down slightly. And the key factor being IGF-1, insulin growth factor one, this secondary growth hormone ... This is not GH. This is not growth hormone that your pituitary gland produces, but perhaps not at the level most Americans have in everyday life. So, in other words, we've survived with considerably reduced levels of IGF-1. And the evidence, certainly from experiments under the animals, suggest that there could be a cancer prevention factor there. And the little sidebar story to this is the story of people with Laron syndrome. Laron syndrome affects about maybe 300, 400 people around the world. They're a very small group of people. The largest group live in Ecuador, and they have a genetic defect that means they can't produce IGF-1. They have nominal levels of IGF-1. And as a result, they art short in stature, they're about three, three and a half feet tall. And the amazing thing about these people is ... And this is statistically proven, that they just seem not to get cancer. And they don't get cancer ... Well, there's one case that I'm aware of, and the scientist in Ecuador, and Valter Longo is aware of in Ecuador, of a woman who did get cancer and die from cancer. But, generally speaking, compared with their siblings who may be normal in stature, have normal levels of IGF-1. The genetic defect they have is recessive, so it doesn't necessarily mean that all members of the family will be affected in this way. So, they'll have normal heighted siblings, and of course, if you look at geo effects of well, their neighbors, the general diet of the community, if you want to take in all the factors that affect peoples' growth, they are significantly different in terms of their apparent resistance to cancer; diabetes as well. Geoff:	Any longevity data? Or is that too complicated? Peter:	Here's the interesting thing, they ... It's complicated in the fact that it's a small sample group, first of all. They live in very remote areas of southern Ecuador. So, gathering the data is quite difficult, but the evidence so far suggests that they do not ... And this is kind of the spanner in the works. They do not live particularly long lives. They get to a good age, but then tend to die from other things. There's actually quite a high rate of accident amongst people with Laron's syndrome. That may well be as simple as the fact that they are short, and they are more prone to road traffic accidents. Peter:	Anecdotally, they seem to be more susceptible to depression and suicide as well. And maybe that is as a result of being short, and they don't want to be short. Geoff:	Right. Social cultural factors, rather than just straight physiology. Geoff:	Yeah, I mean, I think it's interesting. I think that brings up an interesting point, where I think a lot of these things are trade offs. Because if you're trying to be a body builder, trying to gain lean muscle tissue, growth factor, growth hormone is very beneficial for that. And it seems like, as we get more and more understanding around how these things work, it seems like you'd want to perhaps essentially shift your body in different states. Sometimes you wanna be really looking to put on mass, you might not want to be fasting, you might want to change up your fasting routine. If you're really looking for a period of recovery, anti cancer, anti metabolic syndrome, maybe you'd shift into a period of fasting. But, I think it is naïve to say this is one size fits all, everyone in the world should do this exact written routine. Because everyone's goals is different. Everyone has a different starting point. Geoff:	It should run fast, right? Peter:	In terms of optimizing this five days, how frequent ... So, do you need to do it every month? The clinical trial was actually every month for three months. Maybe that's too much. Maybe it's every three months, every six months. And again, it isn't a one size fits all, so we're all going to be different in that respect. But, one interesting thing you mentioned about muscle mass; one thing I noticed, and others have mentioned, again, purely anecdotally at this stage, is that after the five days, and let's say over the next couple of weeks, when you're re-feeding, I have noticed that my muscle strength ... Obviously, you lose a bit of muscle strength while you're fasting. But, it comes back really quickly, to a point where ... And this is based on my one month experiments at the gym, and keeping lost of data; is that I am stronger, I can perform better a couple of weeks after a fast than I did before. And I think logic would tell me what's happening there were your muscle cells, a little bit like your immune system is kind of rebuilding itself, your muscle cells are regrowing, and you're developing a new system; which is obviously new cells, bigger, better, stronger. It's just another element of fasting that, to me, seems potentially to be quite positive. Geoff:	No, I think that reflects in my own data as well. I think that matches literature around ... I know in a multiple day water fast, human growth hormone actually elevates, and IGF-1 drops. But, the thinking behind that is that your body wants to retain functionally muscle tissue, and growth hormone helps with that, and burn off fat. Like, the body is smart enough to realize that, "Hey, we should not be burning functional tissue with all these fat reserves on our body." So, I'm curious; basically, was that a tipping point for yourself, after you saw the data on your own body? You're like, "Whoa, I can actually measure something? It's not just like in my own head? There's actually biomarkers that actually show potential, that this is healthy for my longterm?" Is this now part of your daily lifestyle? Was that a tipping point for yourself. Geoff:	This was just a one five day fast moving diet trial? Or, as this over three of these five days over three months? Peter:	Correct. The initial clinical trial was three times five. So, three sets of five days over three months. But then, what I did ... And rally, going exactly to your point, I saw this, I learned this about myself, and thought, "Well, that's pretty cool. That's quite exciting." However, there isn't much point in me just doing a one off clinical trial and leaving it there. This is longterm science. We are talking about longevity. So, you've got to try and see it through. So, since then, I've revisited that five day periodic fast several times, over a dozen times now. But, experimenting each time, leaving different gaps between the fasts. And I'm still working on that. And I know that Valter Longo is still working on that as well. This is the company behind ... The food is now commercially available, but the experiments go on. The company, El Nutra, based in Los Angeles, were working with doctors now around the world, and now dieticians to use this food. And it's ongoing research, in terms of what is the optimum time to leave between. So, that's what I've been experimenting with. What I'm actually planning to do in probably the next six months is revisit a more intense use period of this five day fast, and maybe again do it once a month for at least three months. Geoff:	So, I'm actually curious; when you do these five day calorically restricted, ketogenic weeks, what has been a ... You're sort of experimenting, but have you settled on a typical rhythm, or you feel like you're kind of not feeling that good, and you want to sort of re jumpstart your system. Peter:	Yeah. I actually have. I found the rhythm I think that works for me. And there's always a social ... I mean, you'll have found this a million times, probably; there's a social element of this, in terms of when you're doing your fasting. So, I settle on a Sunday to Thursday regime. So, whereas day one is Sunday. And you've got to choose your weeks. Choose your weeks when it's going to be appropriate. There is an element, as one downside of this particular diet, and this is the food originally supplied by USC; is that there is an element of cooking involved, and that you need a stove to prepare the soups. Some you can prepare in a microwave. But, others, I think there's a lentil soup, you do need to slowly cook it over a period of 15 minutes. Geoff:	Are you making your own foods? Or, are you still using the prepared foods? Geoff:	It sounds like it's much more convenient. Everything is counted out for you. Geoff:	Are you fasted right now? Geoff:	I'm about 40 hours into a fast, actually. Peter:	I would never have known. So, how do you feel right now? Geoff:	It's always like a refreshing set point, to recalibrate your week around a typical rhythm. Generally, very clear minded. I had some hard workouts the week before, so I wanted to give my body time to reduce inflammation, and recover, and heal. Doing a little bit of a longer fast than my typical 36 hour fast. Peter:	You asked me if I ever did 36 hours? Geoff:	Yeah. Well, I was gonna ask ... It sounds like you've been very, very diligent around a fast mimicking diet. But, I'm curious; have you gone full into just the pure water fast. Peter:	I haven't, and I should try that. The closest I've come to ... I've done quite a lot of 16 8, so I will evening meal early, and not eat til late morning. I do that quite regularly, and I enjoy that, and I find it very easy. I enjoy those mornings, and I usually ... So, my routine for 36 hours, it's interesting to compare it with yours is, obviously, you have a kind of normal day, finish on a evening meal, and then do your long 16 hours of fasting. And I try to do a lot. The purpose there is to achieve a lot while I'm not eating. So, I'll get up early. I generally go for a swim, and maybe a swim and a long walk, stroke, run, and then get to the office. And then, you look at the clock, and it's already 11 AM. So, it's pretty much over. And I try to embrace that mental agility right towards the end of the fasting period, and often find myself going way over the time, because I haven't just looked at the clock, and I'm busy, and I'm getting things done. Geoff:	Yeah, you're just in flow state. Yeah. Peter:	Yeah. Yeah. Exactly. So, I really enjoy that. But, to answer your question, that's as far as I've gone. I haven't actually gone any further than 16 hours. At part from a couple of times because of medical procedures, surgeries, that kind of thing; a colonoscopy experience. That's enforced fasting. But, apart from that, I haven't. Geoff:	Why? It seems hard? But, I mean, it sounds like if you are relatively good at getting ketosis, it seems like it would be something that's very doable for yourself. Geoff:	To me, without studying the exact literature and how the diet was constructed, it seems to me just like generally healthy meals. Like, these are low carbohydrate, low refined sugar meals, relatively low protein, and then higher amounts of health fat meals. These are sort of classic low carb meals that ... With reasonable whole foods, and all of that. So, it's almost in a way reverting to the basic, simple meals, and don't eat too much. Or, it's like not even going to fasting, it's calorically shifting to some level, and in some ways, it's like, yeah, you're just eating pretty healthfully for five days, in some ways; right? Geoff:	Thousands of years, right? Peter:	Thousands and thousands. So, there's nothing new in that. But, what is new is our understanding, and as it develops, our understanding of why fasting is potentially good. But also, as you say, the combination with a simple lifestyle, that our mothers and grandmothers maybe understood and understand; combining that sort of ethos with the science and, again, the tech that we can use to monitor the fasting, I think altogether is potentially to the greater good. Geoff:	Yeah. Absolutely. I think my sense is that, just like how exercise is how ... Everyone has their own routines for exercise. It's clearly generally healthful to do that. And there's all these different schools of thoughts. I see the same thing happening with fasting, where fasting, the broad concept is generally gonna be seen as healthful, and there's different schools, and different protocols to do fasting for peoples' certain goals. That seems to be a reasonable sense of the future, given historical context. Any last thoughts on fasting? I'm just curious to sort of ... Seeing what other interesting things have you seen, given your Llama podcast, and you have a broad swath of interesting folks coming on your show; what else have you seen, or have you adopted into your personal lifestyle, or are considering to adopt to your personal lifestyle that's not perhaps food or diet related? Peter:	Right. So, if it's not food, and it's not diet related, or exercise related; I suppose the element that I would acknowledge that I could do better on is actually probably that spiritual side, the one that I mentioned from the people of the Loma Linda. They have their exercise, they have their diet. And then, it's very difficult to quantify, but there clearly is something there. And of course, people talk about meditation, and a mindful way of life, and to be where you are, especially. It was Phil Libyn, who you introduced me to, had a great conversation for the podcast; said you have to be a little bit crazy to do any of this, but crazy is accepted in San Francisco. And he's right. But, I think that's spreading. If you consider ... I don't necessarily consider meditation or mindful practices to be crazy. But, it's the area that I think I could do better at. And I think I've learned from, whether it's the ... I interviewed a great 102 year old woman a few weeks ago; Ethel Travis. She lives down in Newport Beach. And we had a fantastic conversation for the podcast. She hadn't particularly, throughout her life, paid too much attention to her diet or her exercise regime. She was a ballerina in her younger life, so she was clearly flexible, and agile, and fit. But, she didn't obsess over especially her diet. But, the big factor, and especially in her later years,, and right now, I drew from her, was that she had a great social life. And she put effort into her social life, into meeting once a week. She described them as her girls, her group of friends. She has a book club; they get a book, they read it, they get together over a meal, and they discuss their book. And she goes to stretching classes, and she likes nothing more than just going out to dinner with people, friends, or having people over to her apartment. And I think that element, of having something just to look forward to, from a spiritual, mindful perspective, however you want to describe it; I think is a big part of what keeps her going. And I think we can't ignore that. Geoff:	Yeah. I'm actually curious; is that a cause, or is that an effect? Because you could image, the skeptic in ... Or, not the skeptics, but the scientists, like, "Okay, is Ethel just an energetic 102 year old, and therefore she's applying all her energy to all these social activities? Or, is it the reverse, where she's doing all these activities, filling her life with an abundance of activities, and joy that's making her live longer?" Right? "Maybe it is just a virtuous cycle. Who knows?" That's an open question, perhaps. Peter:	It's a totally open question, and I think everything is intertwined. So, I think it is the ... There's cause and effect. I think a huge part of this is just doing the doing. Her body is moving. Her mind is working. She's planning ahead. He's thinking about people. She's organizing the next event. And then, to achieve that, her body physically reacts to actually get there. So, everything is working; from the brain, to her legs, to her eyes, everything is involved. So, the synapses might be snapping in her brain, but it's a full body experience for her. They say, "Aircrafts are best in the sky. Keep them moving. Keep them working. They're engines, and engines are best when they're working." You know more about this than I do. See the body as an engine, and keep it moving, and it keeps working. Geoff:	Yeah. It stands to reason. I think we all probably anecdotally have seen older folks in our lives who seem like they're this sort of dimming, in terms of the joy of doing things. And it's like ... So, it's interesting; is that the cause or the effect? Where does that spark come from? If you are getting into more of the later stages of life, can you sort of mind over matter, re-find some spark? Peter:	I think you can. Another guest I had, a guy called Floyd Norman, he's 82 years old. He's quite well known. He's famous in the animation world. He was the first black animator to be employed by the Walt Disney Company. He worked with Walt Disney in the 1950s. He kind of made news, because at the age of 65, he was asked to retire; he was forced to retire by Disney. That was just the time when most people, at most modes of life, that is when you retire, 65. He didn't want to retire. He hated it. He was depressed at home, and he kind of forced his way back into the company by going freelance. And to this day, at the age of 82, he is still working, doing what he loves, and that is as a cartoonist. And he's still doing that, and he wanders around the Disney lot, and he's still got a purposeful life. But, I talked to him about how he stays young, and one of the things he does, and it's really fascinating; he's moved with the times. He isn't just one of the old guys with a pencil and paper. He has embraced technology. He's embraced digital editing. And he used Final Cut Pro 7 for a long time, like a lot of people, and then Final Cut 10 was introduced; many editors hated that, and were forced to learn from scratch the craft of editing using a different software. He did that himself. He embraced it. Many, many others in his position would have shied away from that. Geoff:	Yeah. It's rare. It's rare. Peter:	He embraced it perhaps more than someone 50 years younger might have embraced that particular task. And he says that is one of the big things that keeps him young, by facing up to these challenges, and being with younger people, as well; he says most of the people that he works with now, clearly, and it's kind of obvious that they will be younger, but he embraces the fact that they are younger than he is, to work with, and to socialize with. Geoff:	Yeah. I think there's definitely a notion around if ... And I think that's a big part of the fasting communities, are sort of just talking to other bio hackers, or people interesting in longevity. If more and more people around you are talking about exploring these concepts around being more healthful, you naturally gravitate and shift your own behaviors more towards that new normal, as opposed to a very complacent, standard culture that doesn't really care about health until you're actually sick. Peter:	That's a really good point. And I think that what we do socially, and how we interact with people who are like minded ... And it's why I like talking to you, and people doing the kind of work that you do, because you are enthused by the knowledge of others trying, and experimenting with things that you're playing around with. You have your breakfasts, and I really enjoyed that day, because there's a group of like minded people. No one's quite certain as to how this is affecting us, but the group knowledge that you can glean something like that is motivating. It's the same as our 82 year old animator working with younger people, doing the same kind of work. You can draw a lot from that. It's difficult to quantify this. You can't really apply data to what we're getting from that social situation. But, it's tangible to me that we do benefit a lot from it. Geoff:	Yeah. I think it's setting culture. If people are saying that, "Hey, the default norm is kind of just normal," it's not. It's actually just kind of a crappy culture that's not really well defined or thoughtful. We actually have some audience questions. What did you take for granted most when you were younger, now that you appreciate being older and extending longevity? Peter:	That's a great question. Taking for granted when I was younger? If we maybe turn the question around a little bit, it's not so much taking for granted, it's just not thinking about your health and longevity. And I suppose, therefore, you're taking for granted your ability to run a marathon at the age of 32, or whatever it is. So, yes; you are taking for granted your state of health, and what you can achieve at that young age, and perhaps not thinking about ... And if any 20 year old, 30 year old asked me for advice, it would be to think more seriously about the progression over the years, and what you can do when you're younger to perhaps slow down that progression, that deterioration, that inevitable deterioration in your physical ability that is clearly going to happen to all of us. But, we all know that there are things we can do. So, I suppose ... I mean, it's kind of obvious; you take for granted what you can do. Geoff:	Yeah. I think it's funny. This is like the old fogy advice you hear as you're growing up. But, I feel that more and more as you just don't recover as fast, or you have these injuries that take longer to heal, or ... Yeah. You can't necessarily run as fast as you did when you were 22. Yeah. It's interesting. It's like now I feel like I'm being the old guy on the porch, being like, "Be thoughtful, maintain ... When you're early." But, I think it's kind of a learning process for people. I think when you are young, there is some sort of bliss to that naiveness of being youthful. But, hopefully ... I think with culture, with things that we're talking about and educating people on, people can be a little bit more thoughtful when they're growing up, and have the abundance of energy to be experimenting with some of these longevity behaviors. Geoff:	Optimize earlier, right? Just be more thoughtful early. Yeah. Geoff:	I want to adapt a question here as a nice segue, or to wrap up here. So, what are you excited about moving forward? What are the most interesting technologies, interesting developments? I know you mentioned a little bit about looking forward to the new Apple watch. What are the key things that you're most excited about in the coming few months, coming years? Geoff:	Does it look like blood work? Does it look like crazy wearables, pseudo implants? Because I know you probably saw me wearing a continuous glucose monitor at some point. Geoff:	What does that look like? What are the tangibles? Are you gonna be in like drawing 17 vials of blood every week? Geoff:	Yeah. This is not our religion. We're trying to be data driven here in enhancing our own life, not trying to subscribe to fasting as a new age religion. And I think we align very much closely there. We're here, we're generally healthy, and we want to be more healthy. Let's be smart about it. Peter:	And it's fun. You can't deny the fact that what you do and what I do is fun to do. I love meeting all of these people I talk to from the podcast; from the distinguished scientists, to the 102 year olds, they all have different messages, and different life stories. Very often, it really amazes me sometimes, you'll ask the same question of people from very different walks of life, and you'll get pretty much the same answer, based on different experiences, about lifestyle, especially the sort of spiritual side of life, and that really interests me. So, I love that journey I'm going on, meeting all these different people, and learning from them. Geoff:	Well, thank you. I think that's a great closing thought. Let's keep going on adventures and learning from more people. And it sounds like definitely, for the audience out there, check out the Llama podcast. It sounds like there's a couple great guests, and I know you have Phil Libyn on there as well, who's a friend of mine, who's been doing a lot of fasting. I didn't know him when he was overweight, but you look at old photos of him, and he was a big, big dude. And now, he's like a nice, slim, fit looking gentleman. So, check those episodes out. Peter:	You know his story. He's got a great story. It's an extreme story, and it's quite a unique story, but he tells it very well, his experience. From what I can gather, he's still doing it. The interesting thing he's figuring out, of course, he's got to his optimum weight, but he wants to figure out how to continue fasting in the future, obviously without losing too much more weight, because that wouldn't necessarily be good for him. But, he puts the mental euphoria, of that state that you get into. Geoff:	Absolutely. Peter, it's always fun to chat. So, I'm sure we'll continue the conversation. Of course, when you drop by next to San Francisco, please come again. Geoff:	And I'll drop you a line when I'm down in LA. Peter:	One thing I should do that we talked about a number of times, I should start some breakfasts here in Los Angeles, to get a few like minded people together to break fast. Geoff:	Yeah. Biohacking breakfast in LA. Peter:	Anyone listening, anyone watching, get in touch with me through @ PeterBowes, or wherever. And we'll try and organize something. Geoff:	All right. Cheers. Thank you so much. Geoff:	Peace. Awesome. Peter is one of the few people that I've come across that are just so energetic and so curious around ... And has such an aura of positive energy. And I think that's the type of people that we need around changing culture, and changing what we think about fasting, or other longevity benefiting routines. I'm sure we'll get updates from his adventures, and his routines, and his thinking as it evolves through his experiences learning in bio hacking. As always, love the audience questions. Definitely keep those coming in. Zhill is gonna have those up before the podcast, so we can get your questions, your concerns, your hard jabs in there. As always, we'll be on weekly. Find up on Apple, find us on YouTube, SoundCloud, and Google. Thanks so much. See you next week!